It's the middle of your writing block and you sidle up to a student to have a writing conference. You feel like you made a difference with that kid. You feel like you accomplished something. But then you start doing the math... "Let's see, I just spent 8 minutes with this student, so at this rate it'll only take me... hmmm... 9,000 years to meet with everyone." It quickly gets overwhelming and you may start wondering, why even bother? 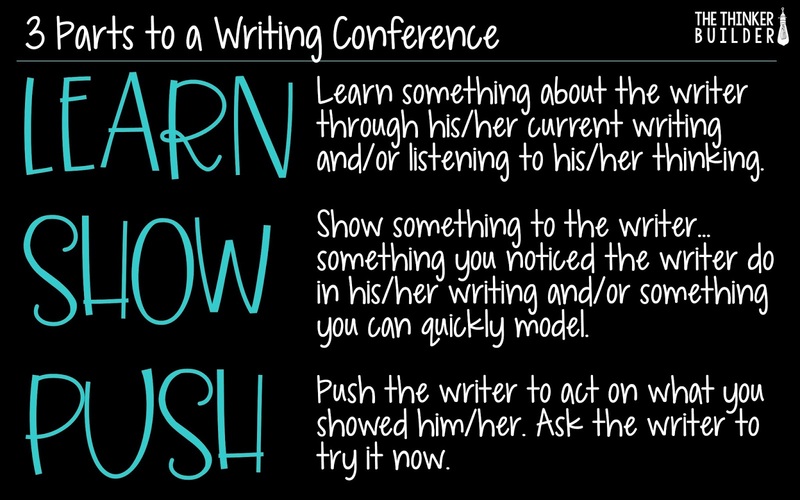 Holding one-to-one writing conferences with students is a really effective way to help them grow, but conferences that last 8-10 minutes a pop just aren't sustainable. Even 5-minute writing conferences are tough. 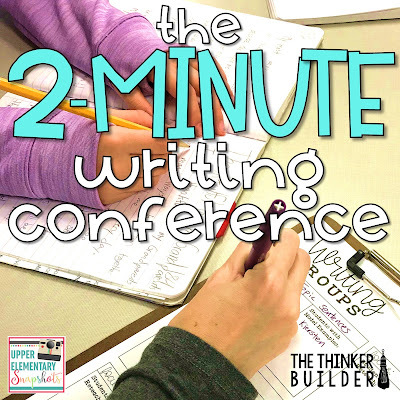 So are 4 minute writing conferences. We'll break our time into three sections: Learn, Show, and Push. I want you to keep in mind this isn't meant to be a formula, but I also recognize that it can be really helpful to see exactly how those two minutes might get filled. So let's meet with one of our students, Leroy, and see how a two-minute conference might run. And boom... our two minutes have begun. With Leroy, let's imagine we noticed him describing his setting, and we think he's ready to take it to the next level. So we're going to first show Leroy what we noticed: "Let's look at this little part you wrote here, Leroy. I see that near the beginning of your piece you wrote two details about the setting, one about being in your house and one about it being a Saturday morning. I can tell you are trying to think about that part of your writing. Then we model something new for Leroy: "So Leroy, when writers are trying to establish their setting, they do what you did: they describe the place and the time. But to really be successful, they use sensory details that really help the reader imagine the setting. For example, I see that most of your narrative so far is taking place in your bedroom. So we could try adding another setting detail that can help the reader picture your bedroom. If it was my bedroom, I might write, "The stench of my dirty socks strewn all over my bedroom floor almost knocked me over." Do you see how that helps the reader put themselves there in my room? What sense did I use with that extra detail? We transition from showing and modeling to giving the student an action step. "So Leroy, think about your own bedroom and how it was on that morning when your story took place. I want you to try adding a sensory detail that will help bring the setting alive for your reader." If Leroy gets started right away, we observe and simply be a sounding board for him. If Leroy struggles to get started, we might make a suggestion or ask a leading question to help him get the ball rolling. "I added a detail involving smell. 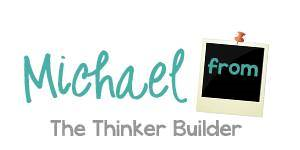 You could do that too, or think about sounds, feels, or specific sights." If Leroy stares blankly at his writing, not sure what to do, that's okay. He might not be ready to make this jump, or maybe he does understand but this particular situation is just stumping him. Again, we might make a suggestion or ask a leading question. Depending on the student and the situation, we don't necessarily need to stay and continue to watch the student work. We leave the student with a closing push: "As you continue writing, Leroy, and your setting moves, I want you to think about those extra sensory details here and there that you can add, okay?" 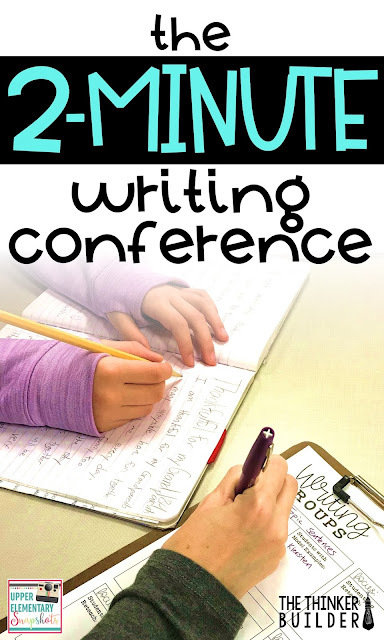 Utilizing this two-minute outline with your students is one key component of a practical and effective system of writing conferences. But what about keeping all the interruptions at bay? And what about other types of interactions like strategy groups and check-ins? And what about the forms on which to keep records? And how does this change the big picture of my writing block? What does a week of independent writing really look like? Don't worry! Head over to my blog where I get deep into ALL of those questions in my post, How to Have Successful Writing Conferences with Student Writers. You can pick up all the forms I use there, too!